Citation Information: JCI Insight. 2019;4(7):e126544. https://doi.org/10.1172/jci.insight.126544. Hypertrophic cardiomyopathy (HCM) is triggered mainly by mutations in genes encoding sarcomeric proteins, but a significant proportion of patients lack a genetic diagnosis. We identified a potentially novel mutation in ryanodine receptor 2, RyR2-P1124L, in a patient from a genotype-negative HCM cohort. The aim of this study was to determine whether RyR2-P1124L triggers functional and structural alterations in isolated RyR2 channels and whole hearts. 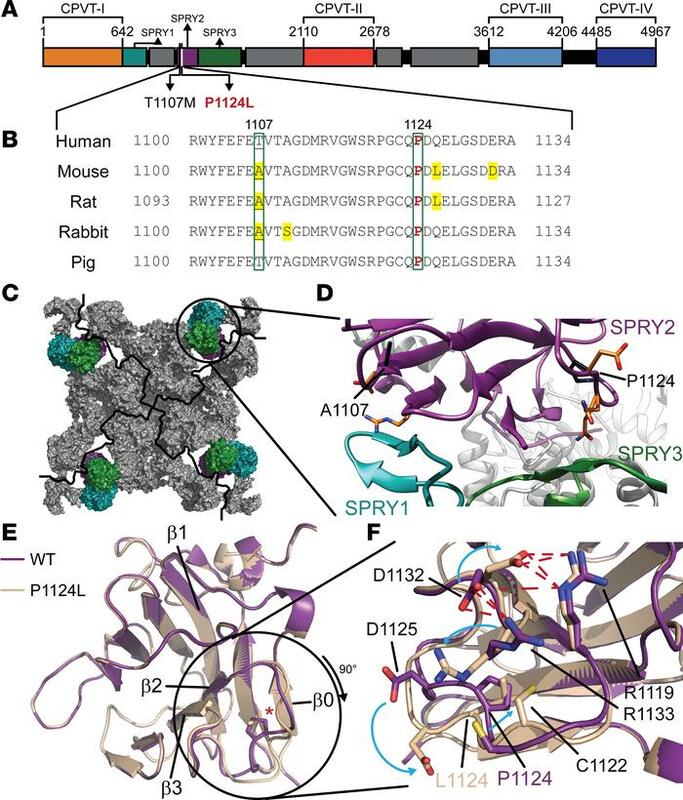 We found that P1124L induces significant conformational changes in the SPRY2 domain of RyR2. Recombinant RyR2-P1124L channels displayed a cytosolic loss-of-function phenotype, which contrasted with a higher sensitivity to luminal [Ca2+], indicating a luminal gain of function. Homozygous mice for RyR2-P1124L showed mild cardiac hypertrophy, similar to the human patient. This phenotype, evident at 1 year of age, was accompanied by an increase in the expression of calmodulin (CaM). P1124L mice also showed higher susceptibility to arrhythmia at 8 months of age, before the onset of hypertrophy. RyR2-P1124L has a distinct cytosolic loss-of-function and a luminal gain-of-function phenotype. This bifunctionally divergent behavior triggers arrhythmias and structural cardiac remodeling, and it involves overexpression of CaM as a potential hypertrophic mediator. This study is relevant to continue elucidating the possible causes of genotype-negative HCM and the role of RyR2 in cardiac hypertrophy. Position of P1124L in RyR2 and crystal structure of the SPRY2 domain. (A) Linear representation of a single ryanodine receptor 2 (RyR2) subunit, indicating the regions where CPVT mutations are clustered (CPVT-I through -IV). The 3 SPRY domains are indicated and color-coded in all panels. (B) Amino acid sequence of a region of SPRY2 RyR2 from 5 relevant species. Residues corresponding to the human 1107 and 1124 are highlighted. Accession numbers and other species and isoforms are indicated in Supplemental Figure 2. (C) Electron density map of RyR2 from the literature (20). Subunits are delimited by black lines. (D) Modeled interface between the 3 SPRY domains of RyR2. The positions of the 2 HCM-associated mutations, A1107 and P1124, are indicated. (E and F) Superimposed crystal structures of the WT and P1124L SPRY2 domains obtained from the literature (19) and this work, respectively. Asterisk indicates positions of residue 1124 within the β2-β3 linker. Blue arrows indicate movement of 4 residues between WT and P1124L structures. Red dashed lines indicate salt bridges.